Werlatone continues to set the standard in high power RF components with the Model C8858. This very small 40 dB Dual Directional Coupler, measures only 2.86 x 1.16 x 0.535 inches. While providing exceptionally low loss, 0.4 dB Max., it covers a full 10 - 1000 MHz bandwidth and is rated at 250 W CW. This unit is suitable for commercial and/or military applications. Werlatone continues to set the standard in high power RF components with the Model C8858. 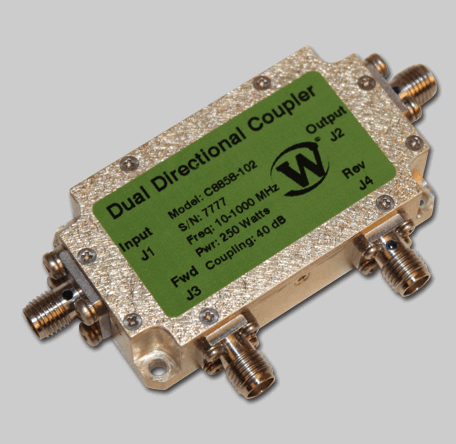 This very small 40 dB Dual Directional Coupler, measures only 2.86 x 1.16 x 0.535 inches. While providing exceptionally low loss, 0.4 dB Max., it covers a full 10 – 1000 MHz bandwidth and is rated at 250 W CW. This unit is suitable for commercial and/or military applications.